For Cindy Montanez in Van Nuys. 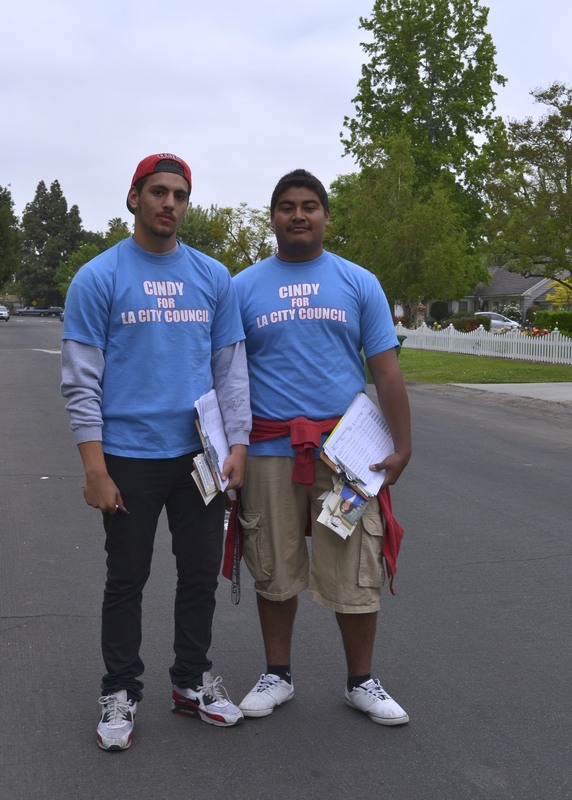 Two canvassers were walking down Orion Avenue north of Victory last night, passing out literature for Cindy Montañez, who is perhaps the best known and best financed person running for the vacant City Council District #6. According to her campaign literature “she is the only candidate endorsed by the LA County Democratic Party”. Montañez (b. 1974) was raised in the city of San Fernando, CA along with her five siblings by parents who were immigrants from Mexico. She attended UCLA. She is an accomplished public servant and explorer who has navigated many hidden corridors of the political landscape. Not yet forty, she stands poised and positioned for state or national fame. Like Mulholland before her, the path to power flows down pipes from the Owens and Colorado River, baptized and blessed by DWP, the largest municipal utility in the United States. *Democratic Assemblywoman from California’s 39th Assembly District from 2002 until 2006. *Montañez stepped down in 2006 to run for the California’s 20th State Senate district. However, she lost that primary to Los Angeles City Councilman Alex Padilla. *After leaving the Assembly, Montañez was appointed to the California Unemployment Insurance Appeals Board and the Los Angeles Department of Water and Power. *Cindy now works as a government affairs consultant for various clients, as well as the Assistant General Manager for the Los Angeles Department of Water and Power. She seems the most likely to get elected. Her name and gender are backed up by solid government work. ← Speaking of God at Fashion Square.